About a week after a hedge fund manager who is popular with the media but has a poor track record of managing risk said “please stop talking about the low VIX”, it gains 44.4% in a single day – its 9th biggest 1-day move. He was suggesting the low VIX wasn’t an indication of high risk. If you have followed my observations, you know that I disagree. I’m one who has been talking about the low VIX and suggesting it is one of many indications of complacency among investors. That is, investors hear “all time new highs” and get overly optimistic instead of reducing their risk or being prepared to manage downside loss. I point out the hedge fund manager’s comment because I believe a low VIX is an indication of complacency because it measures expected implied volatility for options on the S&P 500 stocks. When implied volatility gets to historical low points, it means options traders aren’t paying high premiums for hedging “protection”. Others can believe what they want to believe. I don’t just point out observations at extremes. I actually do something. As I pointed out recently in “No Inflection Point Yet, But… ” the VIX was at an extreme low. About a week later this other fund manager implies it may not be meaningful. That’s exactly what we expect to hear when the expected volatility gets to such an extreme low. We expect to see it shift the other direction at some point. I like to follow trends until they reach an extreme – and reverse. Of course, this is all just one day. We’ll see if it continues into a longer trend. It’s always a good time to manage risk, but sometimes it’s more obvious than others. Bernie Madoff is back in the news lately as it’s now been 5 years since he was arrested for the largest Ponzi Scheme. For some reason, the name is commonly linked to “hedge funds”. Yet, the Bernie Madoff scam wasn’t a hedge fund, his company was a registered and regulated brokerage firm called Bernard L. Madoff Investment Securities. Madoff founded the Wall Street brokerage firm Bernard L. Madoff Investment Securities LLC in 1960. Some large hedge funds lost money because they had invested in Madoff’s managed account. They had Madoff managing some of their funds money. But Madoff Investment Securities LLC wasn’t a hedge fund. If you had an account managed by Bernie Madoff at Madoff Investment Securities LLC you would have had an account owned and titled in your own name. You would have gotten trade confirmations from Madoff Investment Securities LLC when he bought or sold. You don’t get that in a fund. You don’t know when a fund buys or sells. His investment program, then, offered the appearance of transparency – you could see what he was doing at any time. 1. He was the portfolio manager: he made the trading decisions. 2. He owned the broker that executed the trades (as it turned out, they were fake; he didn’t do trades). 3. He owned the custodian: the custodian and broker was the same company. Since Madoff Investment Securities LLC was the portfolio manager, broker, and the custodian, that allowed him to pretend to do trades and print trade confirmations and statements with fake information on them. Madoff Investment Securities LLC was regulated and registered as a brokerage firm, just like Wells Fargo Advisors, Edward Jones, Schwab, Morgan Stanley, and other brokers. You can probably see how the real issue was that his program was a fraud and he was able to do it because he controlled the trading decisions, trade confirms, account statements, and custody, because his company did it all. What if he had been required to custody an another company independent of his? he would have had to convince the other company to participate in his scheme which would likely have gotten him busted sooner. Most investment companies aren’t a fraud, so they would likely report him. Madoff was large and respected – but don’t think that made it any safer. Whether you invest in a separately managed account or a private investment partnership, require that they use multiple service providers that are independent of each other instead of all one company. For example, your portfolio manager is an asset management firm, the broker is a different company that executes the trades and the custodian is a separate company that holds the securities and handles the cash in and out. Then, require it be audited by even another independent company. For example, if you enter into an investment management agreement with ABC Capital Management, LLC that firm is the portfolio manager and the agreement gives it authority to buy and sell in your account. Your account should then be held at a financial institution registered as a broker or bank like Folio Institutional, Trust Company of America, or JP Morgan. You deposit money to that financial institution that holds your money and they send you statements. ABC Capital Management, LLC is just trading the account independently and shouldn’t have custody of the money. If the investment program is a “hedge fund” instead of a separately managed account then it’s typically structured as a private investment partnership, say: ABC Fund, LP. A private fund is operated like a business – the business is trading for profit. You review a Private Placement Memorandum that explains every detail of ABC Fund, LP. When you invest, you sign a “Subscription Agreement” instead of an investment management agreement. You wire the deposit to the bank account of ABC Fund, LP and that money is then wired to the funds brokerage account. It’s best to require the fund to have a “third party administrator” who acts as the funds controller and accountant. That third party administrator is who accounts for your investment and sends you statements showing the value of your investment. You can probably see why you want the administrator to be a third party – independent from the fund manager. Then, the fund is audited annually to verify the administrators accounting is accurate. When ABC Fund, LP is a private investment partnership, it should be operated like any other major business with multiple investors. It has a bank account that sends/receives wires, a custodian that holds securities, a broker that executes trades, a third party administrator that does the accounting and creates profit and loss statements, and an independent accountant that audits all of it. Those should be separate companies independent of each other, not one. Unfortunately, most of the smaller scams we hear about are even worse than the Madoff scheme. The investors write a check to “John A. Doe” which isn’t even a company at all. I don’t think any legitimate investment program has you writing a check to the individual portfolio manager. Deposits should be made to an independent bank or custodian and statements should come from that custodian. In fact, it’s even better to wire the funds rather than write a check. But “You can’t fix stupid”. There will always be Madoff-like scams and people stupid enough to write them a check. If you simply require that all the service providers be separate companies you won’t be one of them. I am often fascinated by investor perception and behavior. I notice it everywhere and study it always. What a person believes makes their world what it is and how they see things. It can also explain their own poor results. You see, if the majority of individual investors and professional investors actually have poor performance over long periods (as evidenced by Dalbar and SPIVA®) they necessarily must be doing and believing the wrong things. I just came across something that said “Why are hedge fund indexes performing so poorly?”. My first thought was “Are they?”. There are a few different hedge fund indexes, but I use the Barclay Hedge Fund Indices because it can include more than 1,000 funds each month across a wide range of strategies. As you can see below, the Barclay Hedge Fund Index, which is the average return of all hedge funds in the Barclay database, has gained 5.22% year to date through August. Is 5.22% a “poor” return when the risk free rate on short-term T-Bills, money markets, and CD’s are near zero? I don’t think so. But, if you compare it to the highest returning index you can find maybe you’ll perceive it as “poor”. For example, the stock market indexes are so far “up” double digits this year, but they can reverse back down and end the year in the red. Stock indexes are long-only exposure to stocks so their results reflect a risk premium earned for owning stocks with no risk management to limit the downside. I don’t know anyone who thinks the stock indexes have created the kind of risk adjusted return they want after declining more than -50% twice the past several years. If they want to compare “hedge funds” to a long-only stock index they should consider focusing on hedge funds that focus on stocks. 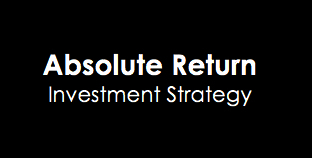 As you can see below, the hedge fund index includes a wide range of alpha strategies. The Equity Short Bias is one of only two that are down year to date and that is expected: they are short stocks and stocks have gained this year, so these strategist that short stocks have lost money. Emerging Markets is the other that is down, which is not terribly surprising since most emerging markets are down. 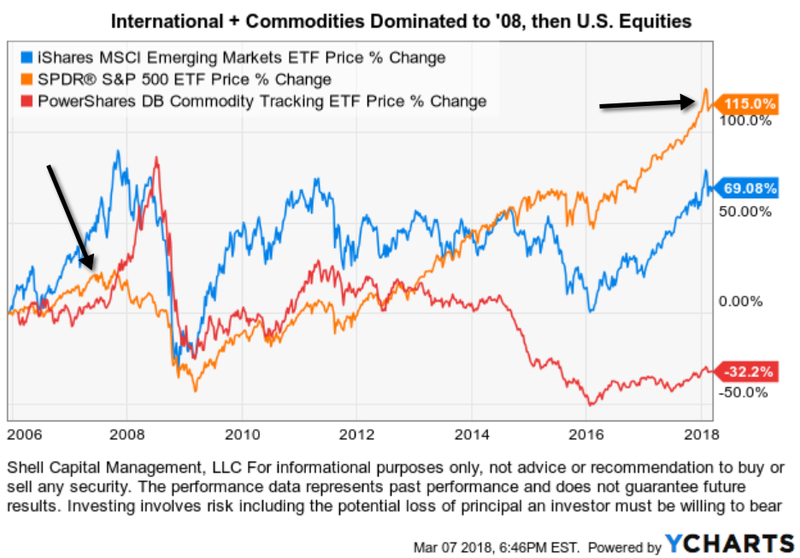 They have still managed risk: through August the Emerging Markets Hedge Fund Index is down -1.73% while the iShares MSCI Emerging Markets ETF is down -13.17%. I’m sure any of those hedge fund managers who are down don’t think that’s “good”, but its just a short period of time. Investment managers are to compare their performance to something to illustrate the general market and economic conditions over a period. Since my investment programs don’t intend to benchmark any indexes, we often use the Barclay Hedge Fund Index as a comparison of this “alpha index” to our programs. In the chart below, we have compared over a full market cycle the Barclay Hedge Fund Index, Dow Jones Global Moderate (a monthly rebalanced index of an allocation across 14 global indexes that are 60% global stocks, 40% global bonds), and the S&P 500 stock index The blue line is the Barclay Hedge Fund Index. Keep in mind that the hedge fund index is net of hedge fund fees while the S&P 500 stock index and Dow Jones Global Moderate does not reflect any fees. If an investor used an adviser, they would pay a management fee, index fund fees, and trading cost, so the net return would be less. 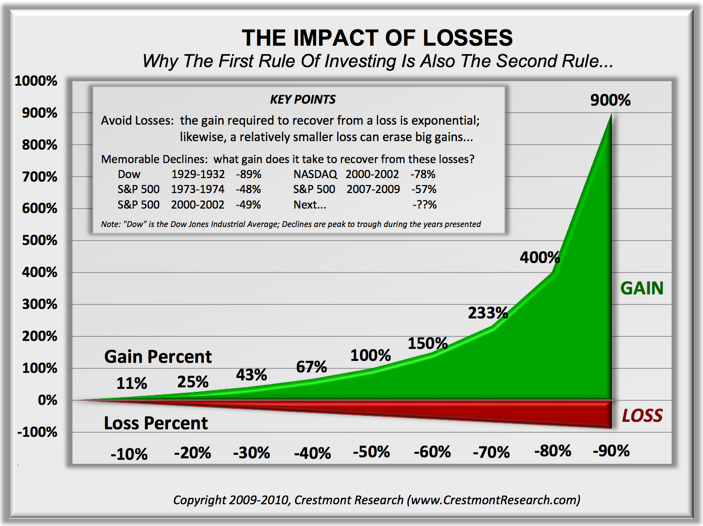 Recently, it has “lagged” the other two, but over the full cycle, its risk/reward profile is significantly superior. Though they all ended with about the same total return, the Barclay Hedge Fund Index declined -24% peak to trough during the 2007 – 2009 bear market. That -24% is compared to -38% for the Dow Jones Global Balanced 60/40 index and -55% for the S&P 500 total return (including dividends). That is the advantage of “active risk management” many hedge funds attempt to apply. Look closely at the chart below and decide which experience you would have rather had. And then, consider that it’s important to view the full picture over a full market cycle rather than focus on short-term periods. As to why the Barclay Hedge Fund Index has lagged stocks lately? They are supposed to. Hedge funds as a group, as measured by a composite index, are investing and trading long and short multiple strategies across multiple markets: bonds, stocks, currency, commodities, and alternatives like volatility, real estate, etc. 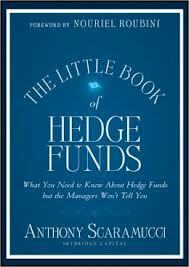 You may also consider that hedge funds are generally risk managers (though not all have that objective). If you look at the end of the last bull market in stocks (late 2007) the hedge fund index lagged 100% stock indexes then, too. You may consider that risk managers are actively managing risk and they could be right in doing it now considering the stage in the cycle. It’s probabilistic, never a sure thing. It worked the last time. Some hedge fund strategies begin to reduce their exposure to high risk markets like stocks after they have moved up to avoid even the early stage of the decline. By doing that, they “miss out” on both the final gains but also the initial decline after a peak. Others wait until stocks actually reverse their trend, which means they’ll participate in some of the initial decline when it happens. Note: you cannot invest directly in any of these indexes. 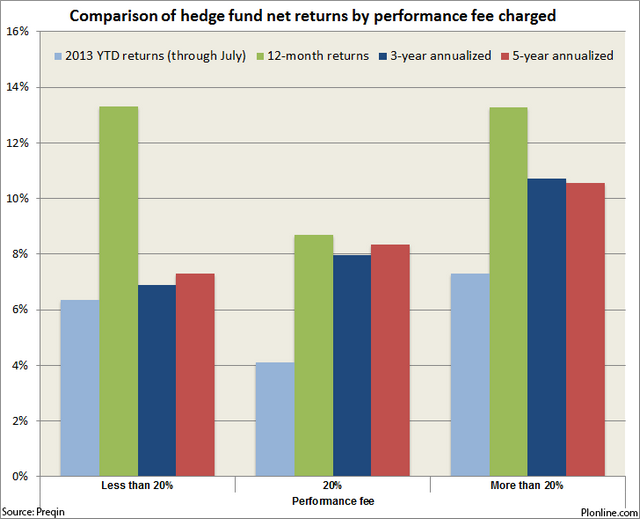 A performance incentive fee is the key compensation for a hedge fund manager. Many people may not understand the concept of “alignment of interest”. For example, an investor recently told me they only invest in private funds because of alignment of interest. Essentially they want the fund manager to profit when they do. For example, if a $50 million private fund earns a 10% net return, the fund manager would earn $1 million of the profit as a performance incentive. If the fund manager earned a 100% return, his compensation would be $10 million. If the fund manager has a loss he gets no performance incentive fee until the loss is fully recovered and the fund reaches a new high. You can probably see why some money managers focus on growing the fund through the process of trading rather than trying to find more and more new investor money. I know people across various sides of the money management industry – the incentives and motivations are vastly different depending on their business structure and specialization. A wealth manager that measures success by assets under management will focus on gaining new clients. An alternative portfolio manager pursuing asymmetric investment returns may have an incentive to focus more on the profits they generate. That is, if you really believe you’ve got some skill, you’ll want to align your rewards in that direction. At least, that’s what an entrepreneur who sells a business for $100 million may tell you. I thought his explanation of pedigree is outstanding. He points out that pedigree is more about a persons actual experience and skill as evidenced by track record rather than the things we would see on a resume like college alumni, GPA, and places they’ve worked. It shows Anthony Scaramucci is the real deal. That is especially true because Anthony himself is a Harvard MBA graduate and began his career at Goldman Sachs before staring his own firm. Getting in and out of Harvard’s MBA program and landing a job at Goldman is an accomplishment, but says nothing about ability to manage money. A portfolio managers pedigree is about executing with an edge and is evidenced by a track record. 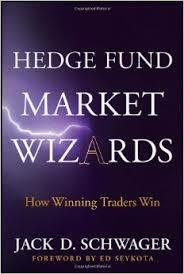 Written to provide novice investors, experienced financiers, and financial institutions with the tools and information needed to invest in hedge funds, this book is a must read for anyone with outstanding questions about this key part of the twenty-first century economy.